The Underside of Joy was written by Sere Prince Halverson. It is her debut novel and is currently the topic of conversation for the BlogHer Book Club. I think if I was asked to describe this book in one word I would have to go with "tearjerker". It's been a pretty long time since a book had me sobbing, but this one had me running for the tissue box by chapter 2. I would like to say "I couldn't put this book down" but I actually have to say I needed to put this book down. The devastation of having your husband die suddenly... and then having to not only deal with the grief... but the trauma of telling your children... and then on top of it all having to deal with possibly losing custody of your children; I just found myself needing to put the book down and walk away every few chapters. Each time the story found a bit of happiness... something would come up that would bring the death and loss and grief right back to the forefront. I am not saying this was a horrible book that I had to force myself to read. In actuality, I believe it was a pretty amazing book. I would have to say that a writer that can have you feel a connection to her characters and her story well enough to bawl your eyes out in chapter 2 is a rather talented artist. I will also say that not all of my tears were sad tears. There was at least one moment that had me sobbing with happiness (and also needing the tissue box). 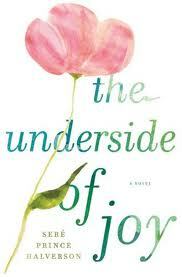 Some words that have stuck with me since finishing The Underside of Joy - "I know now that the most genuine happiness is kept afloat by an underlying sorrow." Such true words. I definitely see how this book teaches that with sadness you truly come to see what happiness you have in your life. You know what it truly means to be happy once you've seen the other side.